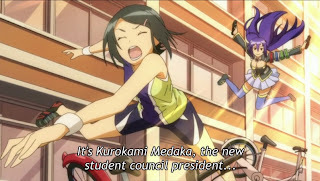 The first half of this episode starts with the Student Council meeting with a girl whose spikes have been sabotaged. Soon, Medaka catches the culprit who denies that she had sabotaged the requester’s spikes despite the belief that she really had. Medaka believes that the culprit had nothing to do with the spikes being sabotaged and Zenkichi tells the truth about why Medaka did not believe the culprit’s lies. 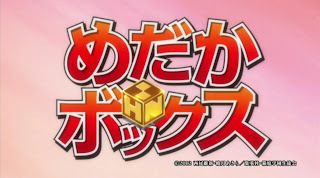 The next day, the girl returns to thank Medaka and Zenkichi, showing them her brand new spikes and a letter of apology. 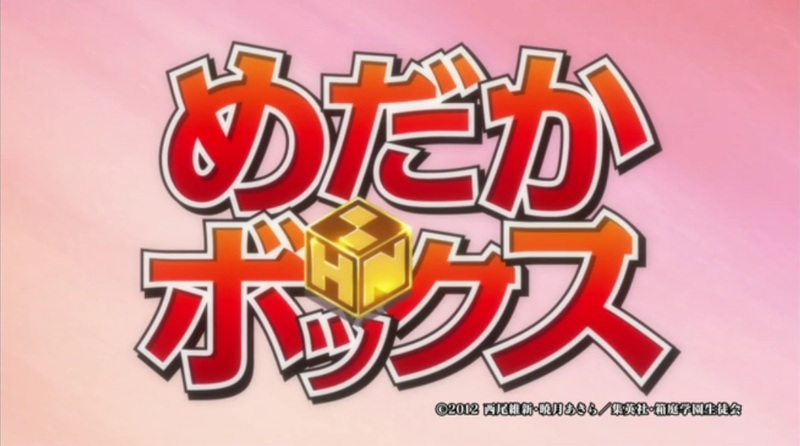 The second half builds a bit more on Medaka’s personality while also proving to be enjoyable. The Student Council get three requests and Zenkichi notices that one of them deals with finding a lost puppy. 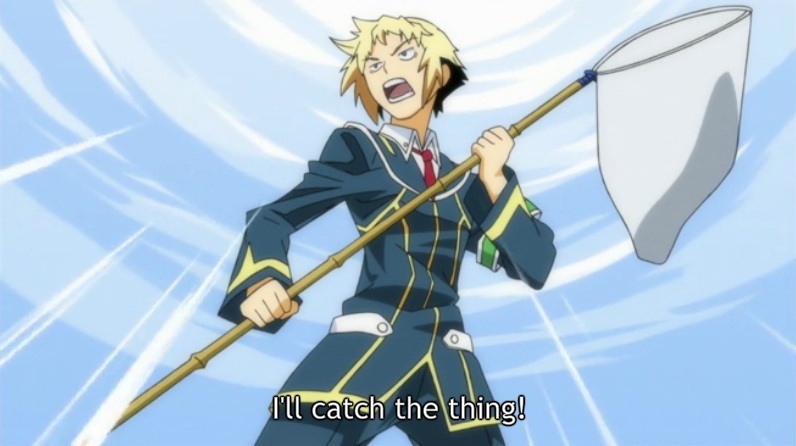 When he tells Medaka this, she tells him to take on that request. Working with Shiranui again, Zenkichi finds the missing puppy which happened to be different from what he expected yet attempted to capture it. 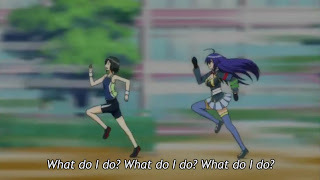 Learning of his failure, Medaka dons a most interesting costume which surprises Zenkichi and Shiranui. 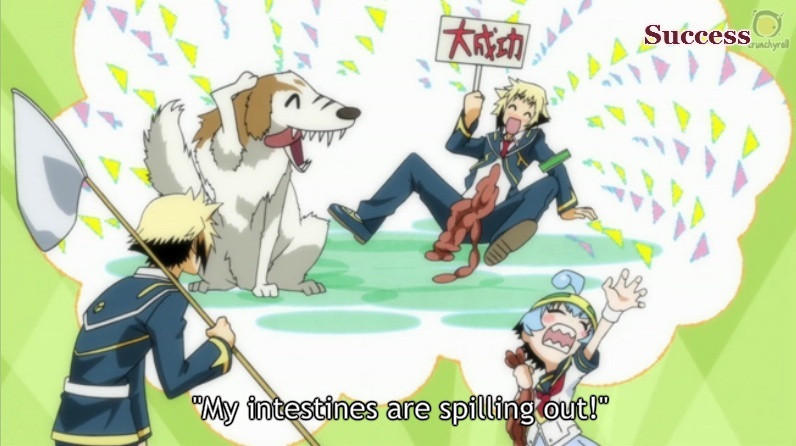 The dog is returned back to its owner as Zenkichi notes that despite Medaka’s shortcomings, she is just as human as any of them. I loved this episode. The animators have done a wonderful job of animating this episode. Despite that it was a minisode, I feel that both delivered what they wanted. The first half focused on Medaka being able to trust even if she was deceived and the second focused more on humanizing her after she had displayed very superhuman abilities in the first half. I did say I had my gripe with the fanservice in the previous episode but when I see them in this, it’s good that they don’t stay for too long however that dog costume may have proven too much even for me. Even if it was one I had long wished to see animated. Next Post:Anime Reviews: Medaka Box Episode 03 – None of your business!! 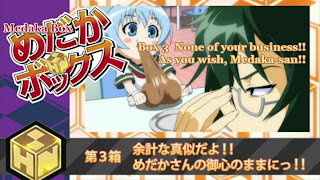 / As you wish, Medaka-san! !